Opening up a world of opportunities – get involved and experience the trip of a lifetime! Moot, Roverway, Jamboree - meet with thousands of members from other countries at these inspiring international camps. Girlguiding is a member of the World Association of Girl Guides and Girl Scouts. Girls have repeatedly said that they would welcome more international adventures in Girlguiding, and to go on a trip is not only an enormous adventure, but also potentially life-changing. Every year lots of trips take place from World Centres, to small and large European jamborees, to projects in under privileged countries and it is through trips such as these girls discover the world, new cultures, different lifestyles and ways of thinking and, sometimes, encounter thought provoking issues of which they were previously unaware. As they take on these challenges they also discover a lot about themselves, and usually return inspired and anxious to make a difference, either to their own way of life or to others around the world whose lot is perhaps less fortunate. Eventually many go on to lead a guiding trip themselves, thus enabling future generations to have the same opportunities. Anglia region has many international opportunities; so if you are 11 years old or over there is an opportunity out there for you! 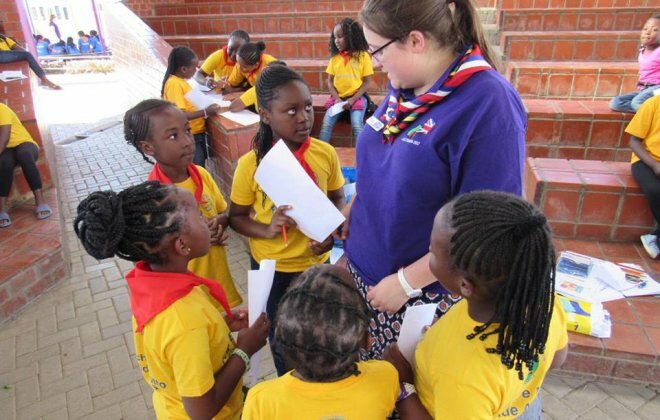 Hundreds of girls from Anglia region have travelled abroad through Girlguiding and had the experience of a life-time. Small trips, big trips, there is something for everyone. Read on or ask your unit leader, commissioners or county international adviser. Take that first step, it will make a difference! International Community Experience (ICE) is for Guides aged 11-13. The purpose of an ICE weekend/trip is to give girls a taste of community action, increase their global awareness and prepare them for international experiences. A trip to any of the World Centres is an unforgettable international guiding experience. The World Association of Girl Guides and Girl Scouts (WAGGGS) run five World Centres in London, Mexico, Switzerland, India and now Africa! How you can get involved in UN or WAGGGS international conferences on issues that women and girls face. The Global Opportunities Pool gathers together exciting WAGGGS opportunities for members aged 18 to 30. Members are given the chance to represent guiding at a range of conferences and seminars all over the world, on issues ranging from the global direction of guiding, leadership, development and social action right through to the environment and women's rights. 'Before going on our trip to Singapore, Fiji and LA, I couldn’t have imagined having as much fun and of making as many close friendships as I did. Not only did we learn a lot about the cultures and differences in ways of life, but I genuinely believe we all developed as people through this character building experience. While being away for a month we took hikes, saw landmarks, taught children, ate new foods, learnt new songs, made new international friends and I could confidently call it the most exciting month of my life. Highlights had to include: teaching games to the kindergarten children in Fiji and playing with them in the sun every day, and our group trip to Robinson Crusoe Island where we all relaxed on the white beach and danced the whole evening together. everyone was so welcoming to us. We painted and helped construct a new village bus-stop, painted the kindergarten and their playground, each taught a lesson during term time at the nursery and ran the whole of holiday school for children aged 3-17.